The Route: National Route 413 starts just outside Sagamihara and climbs the Dōshi river valley to the Yamabushi pass at 1100m. It is 38km long with 1143m of vertical gain. The Feel: you turn your back on Tokyo’s suburban sprawl as finally the road ahead is flanked by woodland. By some measures Tokyo is the biggest urban area on the planet and once you turn on the 413 it feels rural. Not instantly as there’s a waste plant on your left with refuse trucks buzzing in and out like worker bees and the smell in the air is noticeable. You could almost hold your breath to pass before the road dips down. But this is supposed to be a climb? The average gradient here is deceiving, the road rises and falls more than the profile suggests and the first half has several short climbs and descents. The valley here is wide with small farms beside the road, the soil raised into neat rows, one of many micro differences between a ride here and Europe. Often the river is obscured but you cross several giant bridges which invite you to stop and peer down at the clear water. The village of Dōshi is both the halfway point and the start: halfway probably in time to the pass ahead; the start because the climbing picks up here. The village is elongated along but there’s not much for the visitor. A large banner hangs outside the townhall at the moment boasting it’s an Olympic venue. As you leave there’s a small convenience store but if you want to stop, press on because soon there’s a Michi-no-Eki, a roadside station in English and designed as for the motorist or coach tour to pull over, stop, rest and eat. Sounds familiar but in Japan they’re designed to have a local feel, perhaps the architecture and certainly the food for sale and if the raw vegetables aren’t ideal, various rice-based snacks and confectioneries are and there’s a bank of vending machines outside selling drinks. It’s ideal for the passing cyclist to fill up bidons and pockets. Is the bear mascot above that greets visitors here a cyclist? Onwards and the slop picks up, but it’s only 3-4% rather than the usual 1-2% so far and all on the same smooth tarmac but there are fewer and fewer buildings. It’s lined by pines and cedar trees and has a wilder feel, you’ll smell damp forest and spot crushed mukade centipedes on the road, the river on your left is now just a stream. The slope picks up towards the top and there’s a wide hairpin bend and the end of the climb is in sight. This isn’t a climb you go over but through as the pass is through a short tunnel and for once the smooth road ends and the surface is cement with groves just about the right size to sink your tires in, they’re not deep like tram tracks, nor the “valley of death” on a betonweg but enough to preoccupy you and influence steering. Emerge from the tunnel and you can stop to put on a jacket or gilet if it’s cold but the descent down is short, you’ve reached a plateau. Oddly the roadside is littered with tennis courts, most of which look abandoned. What happened? A tennis boom that turned to bust? A weird tax break? Just as you ponder this the road bends and Mount Fuji comes into sight and the stunning view of the vast conical volcano takes over your mind. The Verdict: a long climb but not a difficult one. It doesn’t look decisive for the Olympics but it’s over 1,000m of vertical gain early in the race and it’s the sort of climb where the strong teams will each use up a rider to set the pace. For the local or the visitor it’s strategic if you’re in Tokyo and want a ride into the mountains, it’s scenic. Ride more: keep going and you pass the countless tennis courts and the Marriot hotel – a likely base for teams racing the Olympics – and reach Lake Yamanaka and you can take other roads to the north (say Otsuki and the railway line) or south towards Hakone, or just ride back down turning the long climb into a shorter descent. 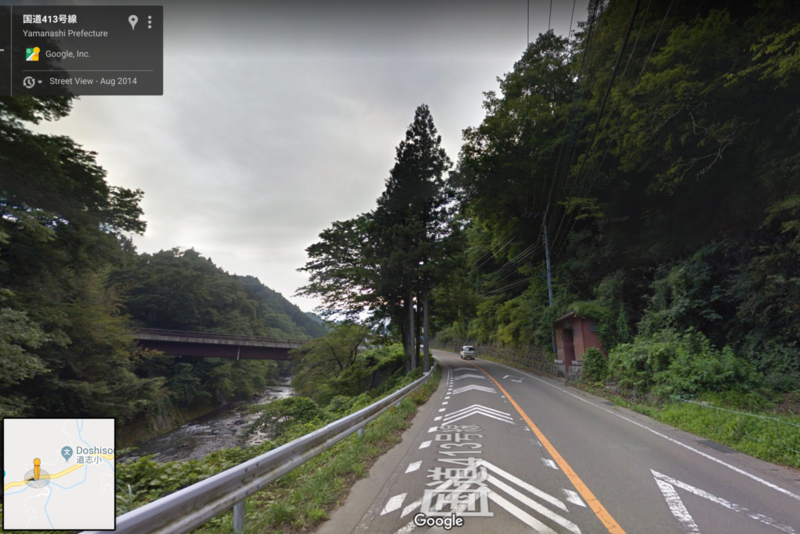 You can also take an scenic detour, turn off the 413 in Hokyoji (宝鏡寺) and you cross the Dōshi river with spectacular views of the river and then climb up a quieter road – passing the Team UKYO service course – and then the Dōshi dam before you can rejoin the 413 again. History: I couldn’t find out if this has been used before in a race like the Tour of Japan but so it’s the future that puts it on the map given the 2020 Olympic road race will go through. 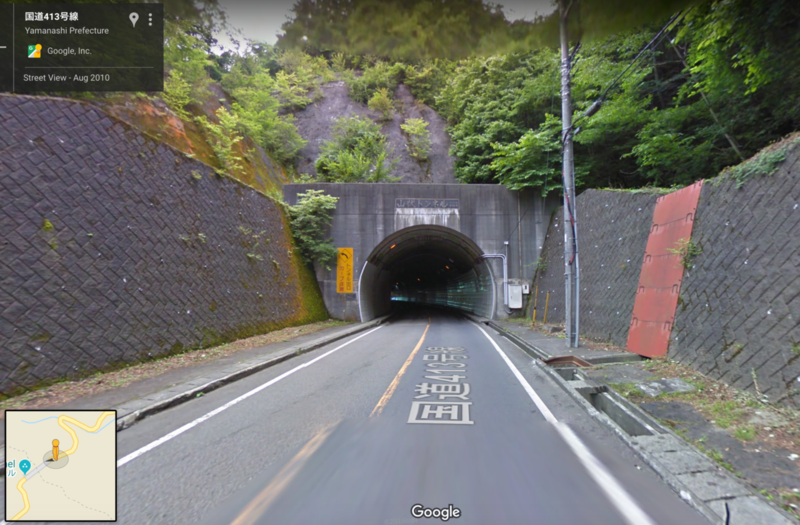 It’s the first climb of the race – labelled Doushi road above – and both the men and women’s pelotons will climb it, unlike some other parts of the course. The race finishes far from Tokyo but for reasons of municipal pride and politics it has to start in the suburbs meaning a procession across uneventful roads before the Tama hills and then out to this climb. Travel and access: it starts 50km outside of central Tokyo and a long ride given all the junctions, lights and more. You can take your bike on any train, just pack it in a “rinko bag”, a small unpadded sack, normally you remove one or both wheels and some bags fold up small enough to fit in a jersey pocket or you can stash it in a coin locker at the station. Everything is cycling related to a cyclist. Bears are no exception. Thank you for the hot tips on Yamabushi! I’ve been waiting for the write-ups of your Japan trip so am pleased to see that the first is up to you usual great standards. I have been thinking of a trip to coincide with the Olympic race. On a practical (boring) note, can I just ask if you took your own bike over with you or if you had use of one once you got there? If the former, I’d be interested to hear on how you got on with the airline and airports. Thanks. I borrowed a bike from ex team mate who now lives in Tokyo. But I did look at travel with a bike, the risks of damage are the same as a short flight. I’ll do a separate piece soon about travelling in Japan, to share a few tips and hopefully invite more via the comments but Japan has a big network of couriers like Yamato and you can either leave luggage with them (like a bike box at the airport) or use them to forward on bags. You probably have more options than just flying into Brussels, Paris or Milan etc. By all means go and visit for the Olympics, note the velodrome isn’t in Tokyo either but Izu/Shuzenji but all accessible by bike or train. One more thing to consider in late July/early August is the weather, it could be pleasant, it could be well above 30°C and with high humidity, there’s talk of starting the marathon and cycling early because of this. Thanks for the reply. I’m pretty apprehensive at the thought of trying to transport my bike from London Heathrow or Gatwick to Tokyo. Would prefer to hire/borrow one once there I think. I’ve used Yamato before when hiking and like yourself would recommend them for forwarding luggage. Agree with you that Japan is great for practical travel solutions, from coin lockers through to longer term storage and forwarding. Also, have experienced a Japanese summer once before and found it so horrendously humid I vowed never again so I only go in spring or autumn. However, it is the Olympics so may brave it. Whether to bring your own bike or rent also depends on the bike size. I’m 183 cm and I was not even able to buy a bike easily in Japan. So I assume renting a 54+ might be a problem. While living in Tokyo for some time I flew many times with my bike and never experienced any problems. Neither with airlines nor with airport transport. I’ve flown to Japan twice with a bike and zero issues. BA fly direct Heathrow to Haneda or Narita and include a bike in standard hold luggage. I have travelled with bikes several times using an EVOC case. Like all cases, it requires some disassembly, but it’s not too hard. Handlebars, pedals and seat have to come off. This can mean you need to carry more tools, but a good multitool can get the job done (if your pedals have Allen wrench compatibility). The best airline I have dealt with for bikes is British Airways. Bike bags just count as normal luggage, provided they are under 23kg. Which is fairly easy with a road bike, less so with a mountain. I have never had an issue with damage using the EVOC bag. For a longer trip, I’d take my bike. The cost of the rental quickly approaches the cost of a bike bag, making the extra hassle of travelling with a bike worthwhile. Surprised that you guys had good experience with BA luggage handling. Statistically, they are twice as likely to lose a bag than European airline averages. After the horrendous experience of them handling a lost baggage case with us, I’m not going to leave them any checkin luggage, let along a £3000 bike. On lost or damaged luggage, it’s a big worry for the travelling cyclist. I often see people blaming the airlines. But they don’t each have their own staff and means to get the bags to the plane, once you hand over your luggage at the airport it’s the same conveyor belt and staff regardless of the airline; and often if lost or damaged the same agent on behalf of the airline at your destination, but some are better than others in case of loss or damage. Should we not blame the airport? On the specific case, we were flying into Heathrow T5, BA’s Homebase. The terminal is almost exclusively BA and operated by its parent company. To be honest, it wasn’t the lost baggage but the sluggish way BA dealt with it that infuriated us. This including gave us false information through their web incident tracker saying the suitcase has been found. They then sebsequently claim that the web tracker wasn’t their responsibility and it could go wrong. It was during this process that I researched them and apparently they sat at the bottom of the league of baggage handeling amongst European airlines. I suppose I’ve been lucky with bikes on BA then. Has been a few years since I took one though. Once with a budget airline to Canada, I only wanted to travel back with a bike so was going to take an empty bike bag with me. An extra bag was more than a bike, so I ended up taking an abandoned rusted frame i found! Thanks for this along with all your articles, very high quality and consistently insightful – a real pleasure to read. I am going to Tokyo in late December, will be cold but would love to ride out there for a day or two if I can. This seems like a great option but any ideas on bike rentals? In Tokyo a few weeks back, I went into an exclusive Bianchi shop where you could buy everything Bianchi – classics through to the latest high end carbon race bike. I’d imagine you could rent if you wanted. Finally, don’t be frightened of travelling with your own bike. I’ve done it loads of times – just get a good bag (pickapackworks if you want one of the best soft bags: although it doesn’t have castors these often fall off anyway even with some of the more expensive brands (Scicon)). It’s quite popular and attracts all sorts of cyclists, you can do a day trip in jeans or a week in lycra and if people get tired of the bridges and blue seas there’s some good riding at both ends into the hills/mountains, all with infrastructure along the way like bike shops, coffee shops with pumps and tools etc and bike rental of all kinds. Thanks for the great write up. I will surely pack my bibs, shoes and vector when I head there. Still not convinced whether to pack the bike, probably too much trouble with 3 kids tagging alone. On the other hand, I think the mascot is a Tanuki (sort of a raccoon dog) rather than a bear. They are often portraited as good hearted trouble makers in Japanese legend & literature. In those 3 decades the only damage I’ve seen to bikes (with ONE exception) is from poor packing rather than mistreatment by the airlines or airports. When packing any bike in any container I always use foam pipe insulation tubes to protect the frame and insure that anything that comes loose in the bag/box doesn’t end up damaging your bike. You never know what the TSA or other airline inspectors are going to do when it comes time to shove everything back into your bag or box, so be extra careful with padding, etc. This foam insulation adds next to no weight and can easily be trimmed to fit with just scissors or a razor knife. One benefit of the rather excessive charges to bring your bike along on your flight is they now seem to be very careful not to lose it – some airlines offer tracking you can access with your smart-phone so you know where your precious machine is at all times. But it NEVER hurts to arrive a day early, just-in-case your bike has been delayed in transit.